The art of engraving gemstones can be traced back to ancient Greece in the 8th century BC and earlier. Techniques passed down to the Egyptians and then to the Romans. There were major revivals of interest in engraved gems in Europe during the Byantine era, the Middle Ages, the Renaissance, and again in the 18th and 19th centuries. At each stage cameos and intaglios, these skillful carvings on a minute scale, were much prized and collected, sometimes as symbols of power mounted in jewelled settings, sometimes as small objects for private devotion or enjoyment. This gem is in the neo-classical style popular in the late 1700s and early 1800s, when taste in the arts echoed the subject matter and style of the Greek and Roman masters. 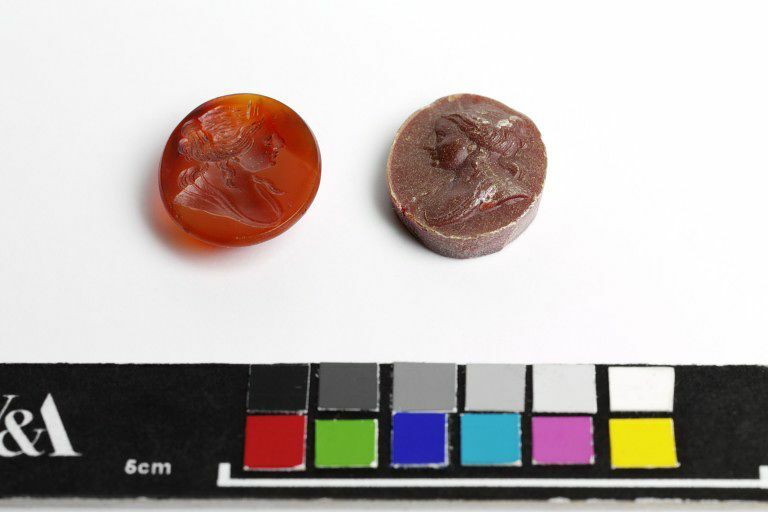 Thousands of gems were made in this style in Italy and brought back by British Grand Tourists, who went there to visit the newly-discovered classical antiquities and archaeological sites. It was fashionable to have portraits executed in the style of a Greek or Roman noble. It could have been made in either England or France. Vertical oval intaglio. 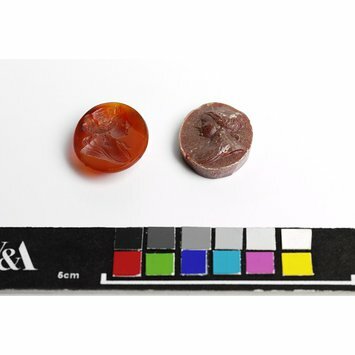 Reddish carnelian. Depicting bust of an unknown lady in profile to left. Her shoulders are covered by a simple gown. Her hair is partly caught up, and partly hangs down onto her shoulders in long wild locks. There is a diadem in her hair. Given by the British neo-classical sculptor Richard Cockle Lucas in 1865, together with twenty-two ivory carvings, twelve waxes, sixteen other gems, a marble group and a portrait in plaster.